Hello! Happy Monday! That means it's time for a brand new Mojo Monday sketch (#250). Julee has created a really fun sketch for us to play with! Coming home from vacation to MN is always bittersweet. On one hand, it's always nice to get home and sleep in your own bed, but on the other hand, you miss those you leave behind... Anywho, I used Hope Blooms on my card today. This month is Julee's birthday month, and in celebration, all Verve stamps are 20% off! Yay for that! I'm also playing along with the CR84FN58 challenge, using the colors Yellow, Red and Neutral. Accessories: Standard Circle - LG and Scalloped Circle - LG Nestabilities (Spellbinders), Die-namics Fishtail Flags STAX (MFT), Twill, Twine (May Arts); Crochet flowers (handmade by Sister Mary and me), Buttons, Foam tape, Thread, Sewing machine. Love your card, Stephanie! This is such a great color combination and layout! Smashing, bright and fun. Do you crochet? The flowers look great with the buttons. Stephanie - what a fun card! I really like the papers and pretty crocheted flowers. The sentiment is just lovely! 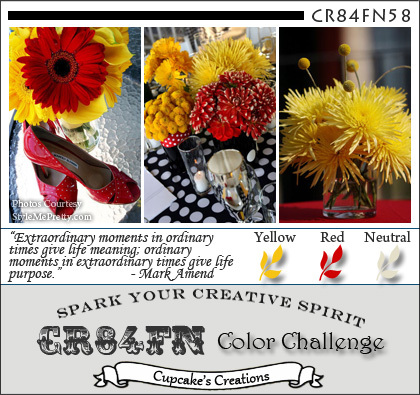 Thanks for playing along with CR84FN! Beautiful card. Love the colors and those crocheted flowers. Those adorable crochet flowers are a perfect compliment to the paper. Love this! What a pretty, happy card! Fabulous! This is GORGEOUS!~ LOVE this sketch and the papers are FABULOUS!!! LOVE this card Stephanie! 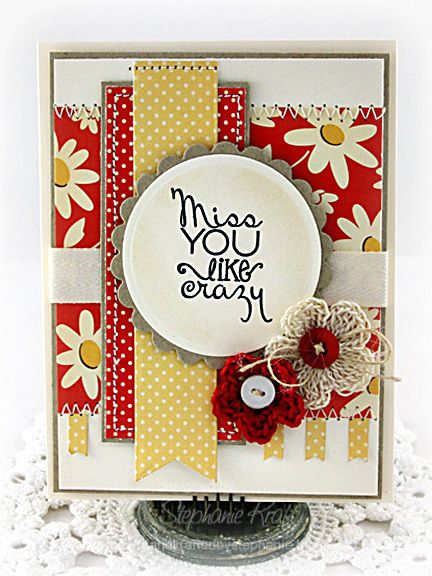 Your sweet layers,polka dots and those fabby crocheted flowers...simply delightful!! I love this! The colors and little crocheted flowers are fabulous! LOVE this card Stephanie! Your papers, stitching and crocheted flowers are all FABULOUS! THX for playing with us at CR84FN! This is beautiful Stephanie, I love the crochet flowers. Love those sweet little blooms. Such a pretty card! Love the flowers and polka dot prints togther and those sweet crochet flowers.